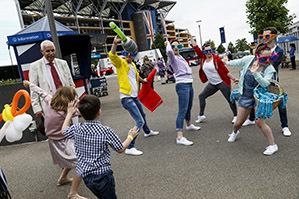 The Spring family raceday featured an afternoon of Jumps racing alongside a range of countryside activities to keep the whole family entertained. Colts and Fillies members collected a free junior racecard on arrival which gave them a guide to the runners alongside a host of facts, puzzles and activities. The Club sponsored the second race and Colts and Fillies Members Amelia and Emily did a fantastic job of representing the Club, picking the best turned out horse and presenting mementos to the winning Owner, Trainer and Jockey. While our club planting area enabled all members to decorate a pot and plant a lovely houseplant to take home. 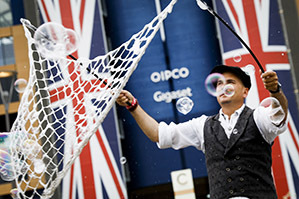 In the main arena there were entertaining performances throughout the afternoon including the hilarious Quack Pack, a stunning falconry exhibition, dog agility and the cheeky ferret roadshow. Away from the arena there was a chance to be hands on with honey and candle making workshops, bygone country skills, foraging with James Wood and willow den building. There was the chance to meet The Gruffalo and Scotty, the Ascot Mascot, was on hand to ensure all the children were having a good time with face painting, arts and crafts, climbing walls and remote-control Land Rovers. Children could also get close to the animals in our petting zoo. The weather was kind and the rain stayed away to ensure a great day out for the whole family. Colts and Fillies members enjoyed a festive treat before racing at our special brunch with guests Father Christmas and Scotty. A delicious brunch was available for the children to enjoy and Mother Christmas read a special Christmas story. Father Christmas and Scotty popped by and were delighted to hear that all the children at the brunch had been good this year so they each received a special early Christmas gift. Out on the track we saw some wonderful Jumps racing with Paisley Park winning the Long Walk Hurdle and providing trainer Emma Lavelle with her first Grade 1 winner. Away from the track the children enjoyed some festive fun starting with the arrival of Father Christmas and a whole cast of Christmas characters. During the afternoon there was the chance to help Mrs Christmas in her kitchen, enjoy crafts in the elf academy and stop by Father Christmas' office where his elves were busy distributing gifts. Rudolph and his friends could be found on Animal Lawn alongside ponies for riding. 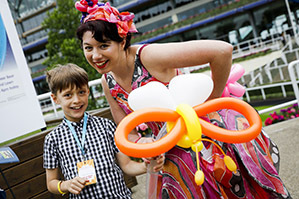 With fairground rides, face painting, Jugglers and balloon modellers there was plenty of fun for everyone. Throughout the day there were appearances from Scotty, our club mascot and the Ascot Greencoat teddy, The day ended with a Christmas Carol Concert in the Grandstand with lots of Christmas cheer and audience participation. Ascot's first meeting of the new 2018/2019 Jumps season was great fun for our Colts and Fillies members. There were seven races to enjoy during the afternoon and trainer Gary Moore won the £100,000 Sodexo Gold Cup Chase with Traffic Fluide. 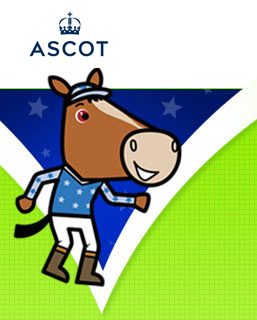 Free junior racecards were available to club members to help them make the most of the racing. Down on the lawns the brave could enjoy thrills and excitement on the white knuckle fairground rides while younger racegoers could enjoy some gentler rides, including the pony variety, and the dodgems proved popular for the whole family. The adventure zone provided adrenaline activities such as bungee trampolines, climbing walls and paratroopers and inside children could partake in craft activities, biscuit decorating and have their face painted. A group of Colts and Fillies Members attended a special behind the scenes tour and after racing there was free popcorn and drinks for members to enjoy while watching the The Greatest Showman. The evening highlight was a charity firework spectacular in association with Ascot Round Table. Everyone gathered in the grandstand to watch the fantastic fireworks which was a great finish to our family fun day. Seven exciting races awaited families heading to Ascot for the Summer Mile Raceday and favourite Beat the Bank took the the group 2 Summer Mile for trainer Andrew Balding and jockey Oisin Murphy. Later in the day children took centre stage with 2 pony races, it was great to see them on the Ascot turf and we may just have seen some of the jockeys of the future. The new designated family enclosure was a hit with children of all ages. Younger visitors could enjoy gentle fairground rides, face painting, pony rides and arts and crafts while the older children challenged each other on the inflatable obstacle course and enjoyed workshops in dancing, football and circus skills. Exclusive Colts and Fillies activities saw members take part in our Jockey workshop and be put through their paces on our mechanical horses by an ex jockey. There was also a rather large amount of cupcakes expertly decorated and consumed! Great weather, exciting racing, picnicking on the lawns and family entertainment all combined to make a great day out for all ages.